Bring your art skills to the table in this workshop! Use pattern, shapes and color to design a unique and functional surface that can be placed indoors or out. 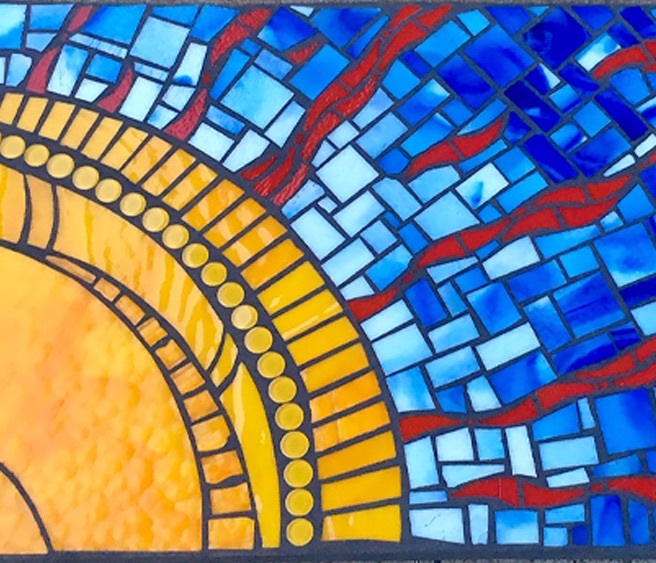 Choose from a huge selection of stained glass and learn to cut and place each piece. Demos in the mosaic techniques of cutting, setting and grouting will be given. Table size: 14\" x 23\". Registration includes this sturdy table with 2- or 3 -shelf option. Mark Brody has been a working artist since graduating from Lewis and Clark College with degrees in art and education. He has taught mosaic and created installations with students in Portland Public Schools for sixteen years. What Mark finds fascinating about mosaic is how the completion of each new project is a transforming and enriching experience. The laying of the tiles is a meditative process of finding the proper shape for pattern, symmetry and design. Mark has compiled many of these ideas and techniques into his new how-to book on mosaic: Mosaic Garden Projects, published by Timber Press.